The Driveshaft Shop Aluminum & Carbon Fiber Driveshafts Are In! If you’ve got a 2005-2014 Mustang GT, GT500, BOSS, or 2011-2014 V6 then we’ve got something for you–The Driveshaft Shop’s high performance carbon fiber and aluminum driveshafts are now in stock! The Driveshaft Shop has been building and perfecting their parts for over 30 years, specializing in building driveshafts for record breaking race cars and performance minded Mustang owners alike. Their lineup of carbon fiber and aluminum driveshafts give Mustang owners two lightweight choices that exceed the strength and durability of your stock driveshaft and are rated to perform on cars putting down up to 900 horsepower. 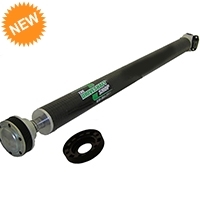 Perfectly balanced and built to last, both their carbon fiber and aluminum driveshafts are significantly lighter than the stock, steel driveshaft. Carbon fiber proves to be a bit quieter than aluminum, as well as being lighter. 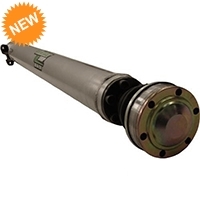 Both types of driveshafts reduce the rotating mass and let your Mustang rev quicker and get down the track faster. This reduction of rotating mass is one of the easiest ways to lower 1/4 mile times while making the most of the power your Mustang is making at the crank. Essentially, a more efficient drivetrain reduces the loss of power between what your motor makes at the crank compared to what it’s making at the wheels. The only thing I worry about with a one peice driveshaft is high speed (145mph plus) vibration… If I run my 5.0 in events like the standing mile, am I better off just keeping my factory two peice driveshaft to reduce vibration? Great addition to your growing product lineup. I know these guys make a quality product. Any chance you’ll be able to offer their 03-04 Cobra piece in the near future?